House in the countryside near the city, with wonderful sea and mountain views., Detached house, large garden, private, and parking for several cars, private pool is only for use by home users, communications with cities such as Malaga, Granada, Almeria, they are by highway. SPECIAL PRICES, TO AGREE IN SEASON from October to February, for long stays. There were a few problems such as no hot water when we had arrived, loo not flushing and an electrical power cut (later on in our stay) but Daniel attended to the problems IMMEDIATELY and with good grace ; and that is what counts. The property is lovely and very secure and very private with a beautiful garden and outside space, well cared for and all impeccably clean. We loved it there and, despite not having a car, found it easy to get into town via a short walk; plus easy access to buses to travel to nearby towns. The kitchen is perfect, the bed that we used was comfortable and the bathroom is huge and well appointed. I would suggest (but it is by no means essential) that some herbs be planted for the use of the guest, a caffetiere/french-press to be provided, and more hooks in the bathroom!!! (there were only two of us there and hanging our wet towels proved to be limited). I do think that, on the website, it should be mentioned that guests would be better off with a car but we managed without one and liked it. The wifi is weak and not worth paying for. All in all, we had a lovely stay and would definitely go there again. I miss the frogs! Everything was great. 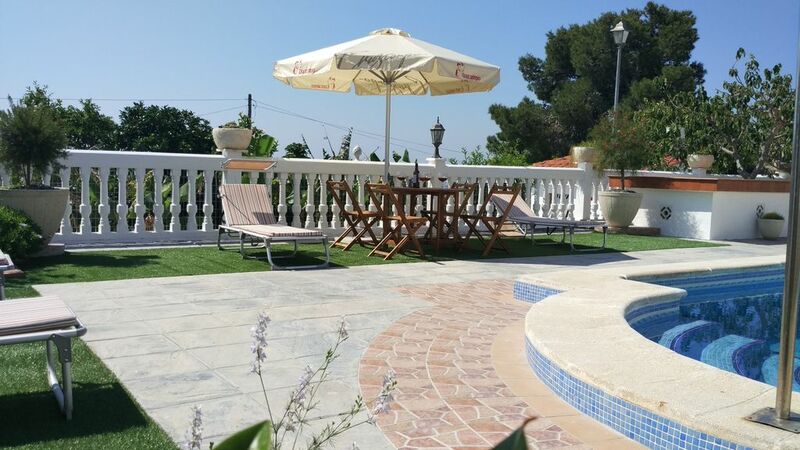 A nice spanish house and a perfect pool area with a large pool, sunbeds and umbrelas for hot days. Very friendly hosts made sure we had a perfect stay. The city center is only 5 minutes away from the house. The location is very good for exploring the beautiful Andalucia. Acabamos de regresar de una maravillosa semana en esta casa y lo recomiendo encarecidamente. La casa y el área exterior están muy limpias y tienen todo lo que necesitas es un hogar lejos del hogar. Nos encantó la zona de la piscina, que es muy grande y hay cuatro áreas donde puedes comer comidas en un paisaje hermoso y tranquilo. La casa también está en una buena posición para ver todos los sitios, incluyendo Granada y Nerja. Las playas también están muy cerca. Nos encantó tanto la casa que volveremos el próximo año. Un agradecimiento especial a Antonia y a Manual por ser anfitriones fantásticos. ¡Nos vemos el próximo año! Het zwembad was heerlijk, de ruimte fantastisch, overal zitjes in de zon en in de schaduw, net wat je wilt. De gastvrijheid is niet in worden uit te drukken. Motril is niet bijzonder, maar je kunt er lekker eten en een terrasje pikken. Prima uitvalsbasis voor Granada, Nerja, Malaga. En nog lekker warm in oktober! Ruhig gelegene, großzügige und gut durchdachte Gesamtanlage, excellente Außenanlagen. Viele Sitzgelegenheiten, so dass wir immer Schattenplatz fanden. Jederzeit sehr gern wieder! Regional cuisine, good places for a typical tapas restaurant.